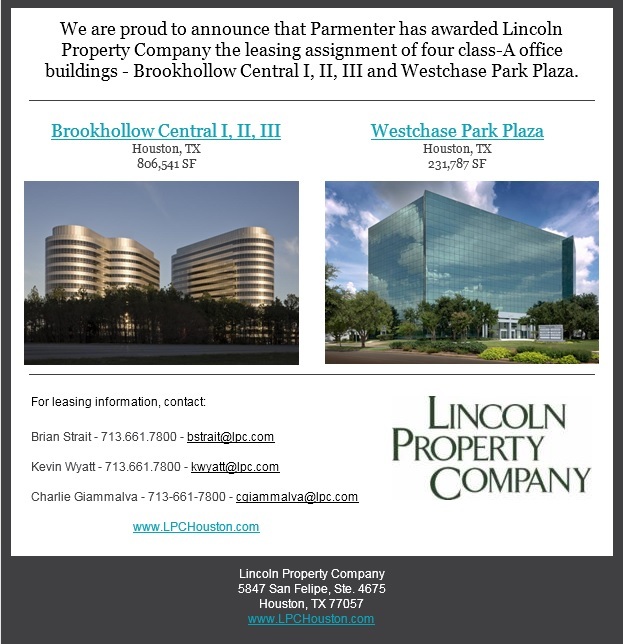 HOUSTON (June 13, 2016), — Lincoln Property Company (LPC) has been awarded the leasing assignment of four class-A office buildings – Brookhollow Central I, II, III and Westchase Park Plaza. Brookhollow Central I, II and III include approximately 806,541 SF of office space, and Westchase Park Plaza contains approximately 231,787 SF of office space. Brookhollow Central is comprised of Brookhollow Central I (2800 N. Loop W.), Brookhollow Central II (2900 N. Loop W.), and Brookhollow Central III (2950 N. Loop W.). Brookhollow Central I is a 12-story tower containing 201,349 SF of office space; Brookhollow Central II is a 14-story tower containing 304,576 SF of office space; and Brookhollow Central III is a 12-story tower containing 300,616 SF. The Brookhollow Central Campus is currently 68% leased and can accommodate office space requirements varying in size from 1,000 SF up to 125,000 SF. The buildings are located in Houston’s North Loop West submarket at the intersection of I-610 and SH-290. Westchase Park Plaza is a 10-story tower containing 231,787 SF of office space and is located in the Westchase submarket of Houston. Currently 67% leased, Westchase Park Plaza can accommodate office space requirements varying in size from 2,000 SF up to 48,000 SF. All four buildings are owned by an affiliate of Parmenter. Brian Strait and Kevin Wyatt of Lincoln Property Company will act as exclusive leasing agents for Brookhollow Central I, II, and III. Brian Strait and Charlie Giammalva will act as exclusive leasing agents for Westchase Park Plaza. They are actively marketing the available space at the buildings. For additional leasing information, contact Lincoln Property Company at 713-661-7800. Established in 1965, Lincoln Property Company is a full-service real estate firm providing leasing, property management and development services through the United States, Mexico and Europe. Lincoln Property Company is a privately owned company with its corporate headquarters in Dallas, Texas. For additional information, visit the company’s website online at www.lpchouston.com. please visit our website at www.parmco.com, or contact Parmenter Media Relations by calling (305) 379-7500 or via e-mail at MediaRelations@parmco.com. LPC Houston is Houston Green Office Challenge Winner!